Ever drive by a neighbor’s yard and wished yours looked as good if not better? And with that another thought, ‘How will I afford redoing my yard?” Landscape design does not have to break the bank. With a bit of ingenuity and a little inspired thinking you can create a lovely yard that will make you proud and possibly make your neighbors a little jealous. Growing a lush, green lawn can be a drain on your wallet. To do it correctly, you should fertilize, feed or put down a pre-emergent three times a year and the price of good products adds up quickly. Weed control can become obsessive. Mowing and manicuring will cost you either in paying someone to do it for you or in the time it takes you to do it yourself. And then there is the high price of watering, especially in the drought regions of east Texas. To start planning how to decrease the size of your lawn, take a walk around the property and observe the natural landscape. Do you have trees? Are there slopes or inclines? Are there decks or patios in place? Envision where you see the reduction considering what you will put in its place. Maybe a vegetable garden, a Zen rock border, or flower beds? Once your landscape design has taken shape you can begin killing back the grass. This will not require harsh chemicals. You can simply lay down newspaper or weed reduction material over the area and cover in mulch. For affordable mulch, contact your local government and ask about the availability of product. Many communities offer it to residents for free. 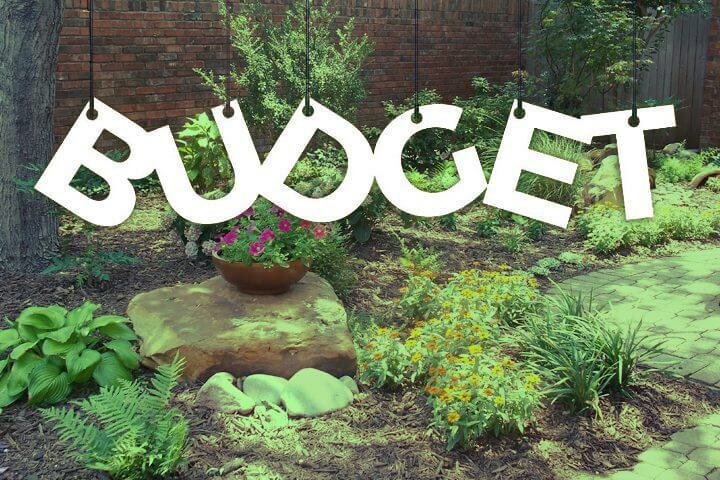 Beautiful garden beds do not need to be expensive and there are many budget-minded avenues you can consider. To start, contact your state conservancy department. Many times they will sponsor conservation days where you can obtain plant materials – even trees and shrubs — at little or no costs. Check into a community garden club. These avid growers thin out their gardens on a regular basis and are always eager to share. When they divide their plants you can benefit from their generosity. There are also non-profit organizations that promote sustainable growing who will often organize plant sales. This is where their supporters donate cultivations from their private gardens. Typically these plants are sold for a nominal cost and the offerings are wide-ranging. Growing from seed requires a minimum investment and the choices are endless. You can grow perennials, annuals, vegetables and herbs. You may not even use the entire seed packet in one season and save the remainder for next year. Once you get more experienced with what you grow you will learn how to harvest seeds from your own garden. That bounty is good for trading with other gardeners. When thinking about what you’d like to grow in your garden do some research and learn about native plants. These are plants that grow naturally on their own in parks and meadows. Because they are native to your region that means they have adapted to local growing conditions. This makes them hardier and more drought resistant – that translate to more budget-friendly because they need less watering and have a longer life span. Once established flowers, trees and shrubs don’t require the constant watering like your lawn. Though it depends upon heat, sun and rainfall, plant beds can typically get by with a good soaking every 3-4 weeks whereas if you want to keep your lawn lush and green it would need a deep watering once a week. If your landscape design calls for decorative materials to be included there are ways to create smashing vignettes without breaking the bank. Plant materials that will be added on a year-to-year plan can easily be filled in with interesting pieces from nature. A walk through the woods might lead to a discovery of beautiful wood pieces. A bed that is designed to be edged in stone could benefit from a trip to a local spring or creek. Here you can find stones of all shapes and sizes that will add great beauty to a border. Round rocks make a nice, decorative edging and flat creek bed rocks can be stacked to create a short wall around a backyard pond. Even large rocks can be placed in the middle of beds and be beautiful with flowers growing around them. Consider making a call to local landscape designers. They might have materials left over from a recent job and would rather give it away or sell cheaply than find a place to store the leftovers. All gardens benefit from rich soil but there is no need to spend money on expensive manure or fertilizers. Start immediately building your own supply of compost. All you need is a sunny spot or a large bin and you are on the way to free plant food. Simply save all your food scraps (not meat items) and throw into the composting pile. Every week get a shovel or large rake and turn over the decaying material. This keeps the pile “cooking” which intensifies the nutrients in the compost. Gardeners refer to homegrown compost as black gold and when doing your landscape design on a budget this is a no brainer. These are a few suggestions for inexpensive landscape design. Hopefully these ideas will jumpstart your planning and lead to creative thinking. Gardening is fun, landscape design is a satisfying creative outlet, and making money-smart decisions is very gratifying.